† Today was another frustrating day in London. The rain came down on all of us and we have done nothing to deserve it. Just apocalyptic rain. Wet in 10 seconds rain. Only-fun-when-away-in-the-tropics rain. No. Not in London. It's summer right? Anyways, it would've been too easy to just stay at home and watch a really good movie and look out feeling smug. Instead, I put on an outfit and went to see the expo I've been meaning to go and visit for a while now; Joan Miró at the Tate Modern. I loved the colours and childlike way of showing the world. 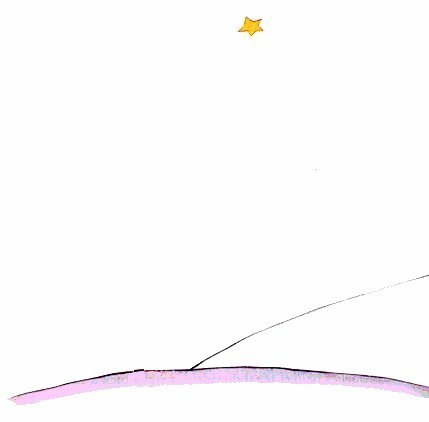 It reminded me of the "Little Prince" and the beautiful drawings in the book. The one below is called "Morning Star", I think it's my favourite period of his. So fragile and beautiful. The girl next to him is from the cover of the latest ACNE Paper, that is sitting on my coffee table with my hair band. I thought that would be a great band name: "Miró and the Girl band"... maybe not. Makes a good composition though. Hope you had a good Saturday too. ...Miró agrees it seems. If you haven't been, you have until 11th September, go see it!